The Romanian government has promised to act against illegal logging, after campaigners showed that a large swathe of trees in a protected forest has disappeared. 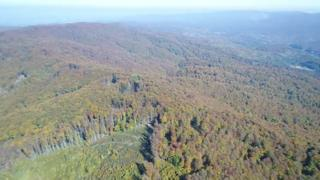 A member of the public recently took dramatic drone footage in the Semenic-Cheile Carasului National Park, on the border with Serbia, showing about 50 hectares (124 acres) of missing woodland on a mountain top, Digi24 TV reports. Semenic contains one of the largest virgin beech forests in Europe, and was included in Unesco's World Heritage List this summer. Corneliu Sturza of the GEA Nera ecological group told Digi24 that the main problem was the failure of the environment ministry to draw up a plan to limit logging in the park. "We've asked the ministry to deal with this for the last 13 years," he complained. The Timosoara Forest Guard agrees. It told the TV station that it was only authorised to repair damage caused by logging, "mainly through replanting and cultivating seedlings", and had no remit to stop illegal deforestation. Although the drone footage has caused a media stir, campaigners and opposition MPs have been demanding urgent action from the government over the Semenic forest for months, citing reports from local ramblers and foreign tourists about vanishing woodlands. Illegal logging is widespread throughout Romania, with an average of 26 cases a day registered last year, according to Greenpeace Romania, and costing the state an estimated $10.4m (£7.8m). Members of the public are very active in tracking the damage, accounting for 42% of all reports in 2016, the Greenpeace report says. This year alone, Timisoara Forest Guard says it has seized the equivalent of 85 lorry loads of illegally-felled timber, worth about $252,000 (£190,000). The environment ministry put out a statement this week saying that it was up to the national park to devise a plan and submit it for approval, but has agreed to appoint a team of investigators, Digi24 reports.